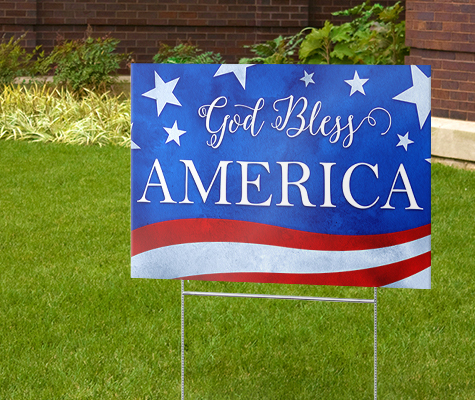 Celebrate freedom with patriotic yard signs. Whether it’s July 4th, a family reunion or summer BBQ, show off your love for Red, White & Blue with these best-selling designs. Patriotic yard signs are a great way to show off your love of America. These signs are made from durable, corrugated plastic and can withstand the elements – just like America! We take pride in our manufacturing and print these amazing designs with high-quality UV inks to promote very long-lasting and sharper images – so that means these yard signs will look great from seas to shining sea. Put your yard sign out year-round in rain or shine. You love your country, and we know you will love these yard signs too.